To know Trevor Bauer the pitcher is to know this: He recently purchased a high-speed camera and spent days during the offseason watching footage of a baseball leaving his right hand at 480-frames-per-second. "To identify the phenomenon of what's really going on," Bauer said earnestly. "Now that I know how it comes off my hand, how do I get to that point?" Get used to the questions. The ever inquisitive Bauer -- MLB.com's No. 9 prospect and the third overall pick last June -- poses a lot of them, usually to himself. Where his peers pick three pitches and go, Bauer stops to think and asks: How many do I need? "I can't really speak for anyone else, but personally, for me, I'm very passionate about my craft and I've always been into science and discovery and all that stuff, so I'm always trying to find a way to get better from season to season. 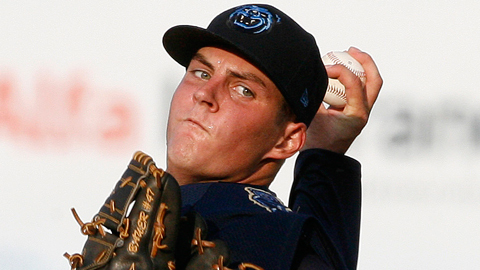 And throwing more pitches is a way that I've found to," said Bauer, who made seven pro starts after signing last summer. "Honestly, throwing more pitches requires more practice on all of them. If you think about the 10,000-hour rule -- you have to put 10,000 hours on a specific endeavor to be considered great at it -- I'm never going to have great command of all of them; there's not that much time." Considering his unique training techniques, detailed in Sports Illustrated last August, he has more time than most. Bauer uses much of it to gain a greater understanding of the dot slider, circle slider and reverse slider, three of his creations and one-third of what must be the most intriguing repertoire in the Minor Leagues. "Three or four of them, I didn't just pick up. I needed a pitch that does this at this speed, so let me design a pitch that does that. They all have a very specific purpose when it comes to my pitch-calling and how I go about attacking hitters," he explained. "The more pitches that I have, that have different speeds and move differently, the more confusion it creates for the hitter. And if I throw all of them out of the same tunnel and make them look the same though 20 feet of flight ... obviously, I'm going to be a lot tougher to hit." And, seemingly, to catch. How does a batterymate with five available fingers keep track of -- and sign for -- so many offerings? It's less complicated than it sounds. When Bauer was at UCLA, where he teamed with No. 1 overall Draft pick Gerrit Cole in the starting rotation, his catcher would call for the reverse slider with a makeshift seven. "So, basically," Bauer said, "he sticks down his thumb and his pointer finger to make a seven-looking figure." Last week, MiLB.com asked Bauer to describe and grade each of the nine pitches he employs. (His grade is based on a scout's traditional 20-80 scale, 50 being the Major League average.) Here is Bauer, in his own words. Origin: I threw two-seamers and sinkers growing up because I didn't throw super hard and relied on a lot of movement to keep the ball down and get hitters off-balance. But I didn't know a whole lot about effective velocity and pitch sequencing back then. Now that I have a better feel for it and what hitters react to and what actually gets them out, I've gone to the four-seam. I find I'm better able to control the movement on it. Purpose: For the way I sequence pitches and try to hit tunnels, it's important to have a pitch that moves consistently so that I know where it started and where to start other pitches to make them look the same. Grip: Straight across the four seams. Speed: Anywhere above 92 [mph]. Grade: I'd give myself a 60 because I don't have the best command of it yet. Velocity-wise, it will continue to get better. I'd say it's an 80 [in terms] of upside. Origin: My dad has always been a proponent of the changeup [since] I started pitching when I was 8. Purpose: I have two variations of it; I can make it cut or I can make it run. I'm pretty confident [using either] to any side hitter. Grip: I grip a fastball but with my middle and ring finger. I don't really ever close off the circle [like a typical circle change]. I basically create an equator around the ball, split the ball in half with my ring finger and thumb, and then everything else lays on there comfortably. And then I just throw the ball so that, when I release it, my ring finger and my thumb are directly on top of each other vertically. Grade: I'd give myself a 70. It's actually the pitch I command the best. Purpose: To get a strike early in the count, or as a put-away pitch. Grip: I have two different grips, one that I use for a strike pitch and then another grip I use when I really want to bury it. Bury it means, primarily, that I'm going to throw it in the dirt. Grade: I have pretty good command on it and it has good break, so I'd give it a 70 on the scale. Origin: I picked up a slider during my junior season in high school, so I haven't been throwing it as long. Purpose: I have two variations -- one of them is more of a traditional cutter, but it has more horizontal movement to it than vertical movement. I call that my circle slider because when I throw it, it comes out with a circle on it instead of a dot. I use that one primarily early in the count to hit tunnels to righties, disguise it, make it look like a fastball or a changeup and keep it in the zone. My dot slider is the one that breaks more. Grip: The only thing I do differently is grip [each] differently. I throw it the exact same. One of them is a very traditional slider grip. I hold it right on the horseshoe of the ball and pull down on the seam. ... The other one, in doing video analysis and playing with different grips, I noticed that I can throw it the exact the same [but] with this grip ... based on the orientation of the grip, the pressure zones it creates as it's spinning through the air, I can get it to move less than the other one. It's been a struggle because the grip is not particularly comfortable, but I'm getting a lot more consistent with it. Speed: The dot slider is about 84-86; the circle slider is usually about 84. Grade: My dot slider, the one that breaks more, I'm going to grade that one about a 70. My circle slider, strictly based on the inconsistency of it, I'll give a 55 or a 60. It will be a lot better next year than it was last year, but it's not as much of a 'wow' pitch as my dot slider is. Origin: Between my sophomore year and junior year at UCLA, [that's] really when I picked up on Perry Husband's Effective Velocity and learning how speed and location interact with each other in the zone. It became apparent that I needed something to go the opposite way at a [specific] speed range. It's a cross between a sinking fastball and a screwball -- it's a little bit slower than a sinking fastball and a little bit harder than a traditional screwball would be. I played around with it and got it done. I used it a lot [my senior] year at UCLA. Purpose: It's designed to be a left-handed cut fastball. I want it to sit in the middle range of speeds and move about 5 inches, just enough to get from the middle of the plate to the outside corner to a lefty or the inside corner to a righty. Grip: If you think about how you grip a slider and how your hand is on the outside of the ball, I just reverse everything. So my thumb position, my wrist position, all that stuff, I reverse. And [the ball] rolls off my pointer finger. Grade: Give it a 50. Movement-wise, people are going to say, "Oh, that's not impressive," but very few people understand how effective a pitch that moves 4 inches is, and especially in that speed range. It's a pitch that I will throw increasingly often as my career goes along. Origin: I was down at Texas Baseball Ranch one summer and talked to this guy, Brent Strom, and he asked me if I threw a splitter. I said no. He asked me to spread my fingers to see how far I could spread 'em, so I did. And he said, "You should definitely throw a split. Your fingers have enough flexibility that you should do it." He taught me how and sent me on my way to practice it. Funny story: I had [Team] USA trials after that -- two weeks after I learned it -- and I actually threw it; it was the only pitch that worked at the trials. I didn't make the team that year [in 2008] but, since then it's been a good pitch for me. I threw it in college increasingly as coach [John] Savage got more comfortable with it and realized that it was a viable pitch for me. Purpose: What's really gotten success -- I didn't have a whole lot of 'em hit -- was in two-strike counts as a put-away pitch. Grip: Traditional, [spreading index and middle fingers]. Speed: In the 86-88 range. Grade: I'd give it a 40 or a 50. It's still a developing pitch, but it's not something I'm going to give up on because the possibilities are pretty great. It's something I have seen work for many guys. If I can get it to be more consistent -- and it will take more repetitions of me throwing it -- it can be a very devastating pitch. Andrew Pentis is a contributor to MLB.com. Follow him on Twitter at @AndrewMiLB. This story was not subject to the approval of the National Association of Professional Baseball Leagues or its clubs.